Leslie Michelson is the Founder, Chairman and CEO of Private Health Management. His book, The Patient’s Playbook: How to Save Your Life—and the Lives of Those You Love, distills his three decades of experience as a medical-case-management expert into actionable steps and practical tools that will empower readers everywhere to achieve the best possible health outcomes at every stage of life. Click to view on the CNBC website. 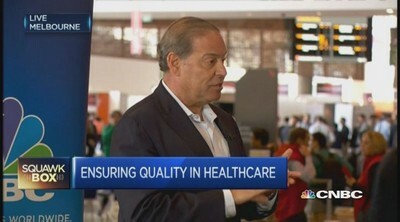 Leslie Michelson is the Founder, Chairman and CEO of Private Health Management, a unique, patient-focused company that has helped thousands of people to obtain exceptional medical care. His new book, The Patient’s Playbook: How to Save Your Life and the Lives of Those You Love, distills his three decades of experience as a medical-case-management expert into actionable steps and practical tools that will empower readers everywhere to achieve the best possible health outcomes at every stage of life. He frequently speaks to audiences around the world, providing life-saving information and a revolutionary approach to medical decision-making. Leslie Michelson has been involved in almost all aspects of the health care system, starting at age 29 when he served as Special Assistant to the General Counsel of the U.S. Department of Health and Human Services, a position he held during the Carter and Reagan administrations. Since then, he has founded and led four entrepreneurial health care companies focused on improving quality of care; he was CEO of the Prostate Cancer Foundation, the world’s largest source of philanthropic support for prostate cancer research; and he has been an active investor, advisor and board member for many companies. He is on the Advisory Board of the UCLA Fielding School of Public Health and the board of the ALS Therapy Development Institute. He received his B.A. from Johns Hopkins University and a J.D. from Yale Law School. He and his wife, Beth, have two daughters and a son-in-law, and live in Los Angeles.